After a delay caused by Michael and Hayley torturing Steph via their games of oneupbirdship, we return to Birds of Australia with Hayley and Michael! This month: The Willie Wagtail. The willie wagtail is one of Australia’s most charismatic birds – jauntily swishing its tail around as it hunts for insects in backyards and parks all over the country (soz Tasmania; in this, as in so much else, you miss out). They’re probably one of a dozen or so birds that almost every (mainland) Australian can identify (laughing kookaburra, house sparrow, sulphur-crested cockatoo, emu, magpie, rainbow lorikeet, galah, black swan, pelican…? ), making appearances in Australian classics like Blinky Bill and Dot and the Kangaroo (even getting its own song in the 1977 movie). Despite its name, the willie wagtail is no relation to the many species of wagtail common throughout Asia, Europe and Africa (some of which occasionally turn up in northern Australia having lost their migratory bearings). 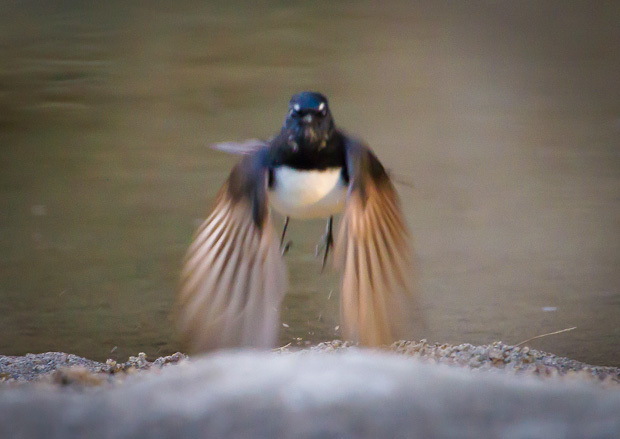 Instead, the willie wagtail is in the fantail family – closely related to the relatively common grey fantail. Technicalities aside, it’s clear that how the willie wagtail got its name – it waggles the heck out that tail, especially when it’s hunting insects. They’re acrobatic flyers, with the fanned tail helping them pull off all sorts of sick manoeuvres in pursuit of little bugs. Their white eyebrow markings give them a fierce frowning countenance and the harsh chattering calls they make when they’re dander is up do give them a more intimidating demeanour than you’d expect from such small birds, but this is no excuse for some of Australia’s large and aggressive birds, who really need to take a good hard look at themselves. A 20g willie wagtail has no qualms in launching angry, buzzing attacks on kookaburras, magpies, and even wedge-tailed eagles, who weigh in at roughly 250 times their size. When I first started birding I loved willie wagtails to death – their gorgeous song, cheeky manner and ubiquity made them a fun bird for a n00b to observe. And they’re really fun to watch, pulling off all manner of stunts (e.g. there’s one at my mum’s house that uses the creepy crawly in the pool to walk on water like some sort of avian Jesus). Gradually though , I’ve been turning against them. 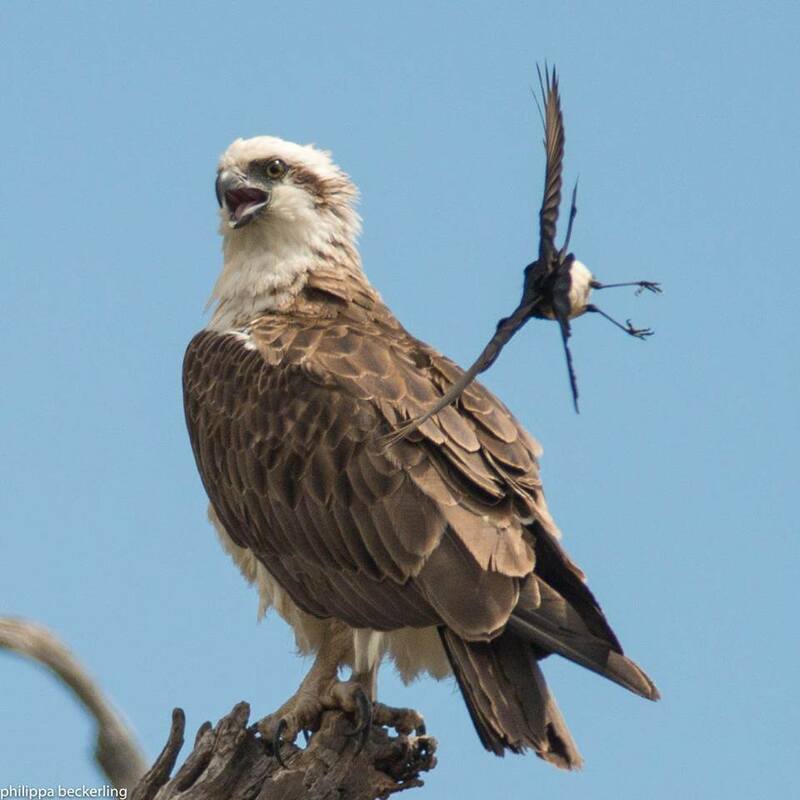 Partly it’s their aggression – nobody likes being swooped, and their chattering attacks put paid to any chance of this particular bird-nerd sneaking up on other, more flighty species. It’s not their fault that occasionally from a distance I’ll think they’re something exciting like a restless flycatcher, but I still resent them for it. I’m not sure where all this leaves me – I’m glad the willie wagtail exists, but it doesn’t fill my heart with joy the way the equally obnoxious galahs and rainbow lorikeets do. I guess I just like my birds in colour not black and white. 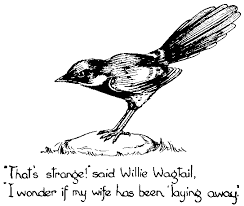 Willie wagtails are chatterers, whisperers. They are clever and they will talk, talk, talk. They can bring you bad news, good news, messages from the dead. It all depends on what land you encounter them. For the Ngarrindjeri People of the Lower Murray River, and the Narrunga People of the Yorke Peninsula, the willie wagtail is an ill messenger, a bearer of bad news. The Gunwinggu People of western Arnhem Land warn against the willie wagtail as a liar and a teller of tales. 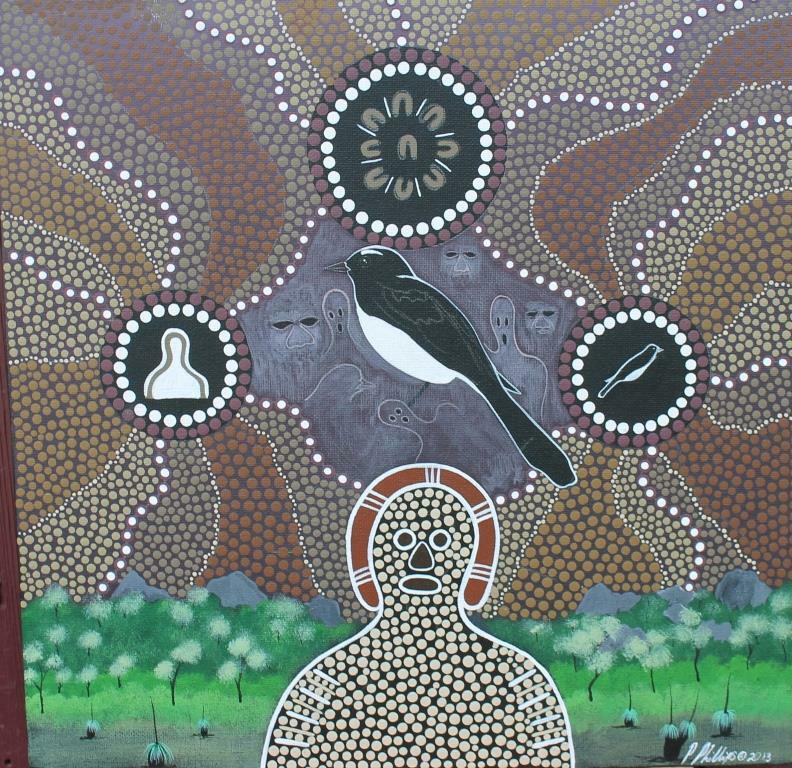 The Noongar People of south-western Western Australia have a story that accounts for the willie wagtail’s aggressiveness – in the time of the Dreaming, willie wagtail was a fearsome hunter. But one day, the wagtail was robbed of their meal by the crow and the dingo. The wagtail never forgot this crime, and now has no fear in angrily attacking bigger animals that encroach on its turf (which basically makes the wagtail the bird equivalent of you whenever you think about your high school nemesis talking crap about you behind the toilet blocks that one time and NO I’LL NEVER FORGIVE YOU ALICIA). Wagtails are also believed by the Noongar People to lure one away from camps. The wagtail catches children’s attention with its hopping movements, and the fact it is quite unafraid of people and will come in close. Then it hops away from outstretched hands, again and again, pulling one further away… until one is lost in the bush, far from fire light. However, in New Guinea, where the willie wagtail is also a native species, they are considered birds of good omen. If you hear a wagtail singing when one is tilling, it’s a sign the yield of crops will be plentiful. Wagtails also have extreme importance in mourning rites in New Guinea’s eastern highlands – if when making offerings to departed family the wagtail was heard to sing, it’s an indication that the soul is pleased and accepts the gift. No mere flashy fashion plate, that wagtail. For myself, the wagtail is an enormously nostalgic bird. As Michael says, wagtails are some of the first birds wee Aussie birders on the east coast can spot easily. Their little jumping movements and imperious tail twitches are something that I’ve never got tired of. They were always markers of holiday drives, being the bird most easily spotted from the car, darting around near road fence lines containing paddocks of cows. Unlike bigger aggressive birds, I can only find their chutzpah charming – it’s a tiny thing that’s had it UP TO HERE with all these magpies and ravens and other more charismatic corvids and is just going to let them HAVE IT. Don’t these birds know about wagtails? Don’t they know they have a conduit to the spirit world and can make them disappear in a tail twitch? Haven’t they heard all the whispers? I love them and their grumpy eyebrows and their beautiful, neat little nests. Damn! I really should have mentioned their beautiful nests.